Behind the wheel of the top-of-the-line Camry XSE. The 2018 Toyota Camry in XSE trim. 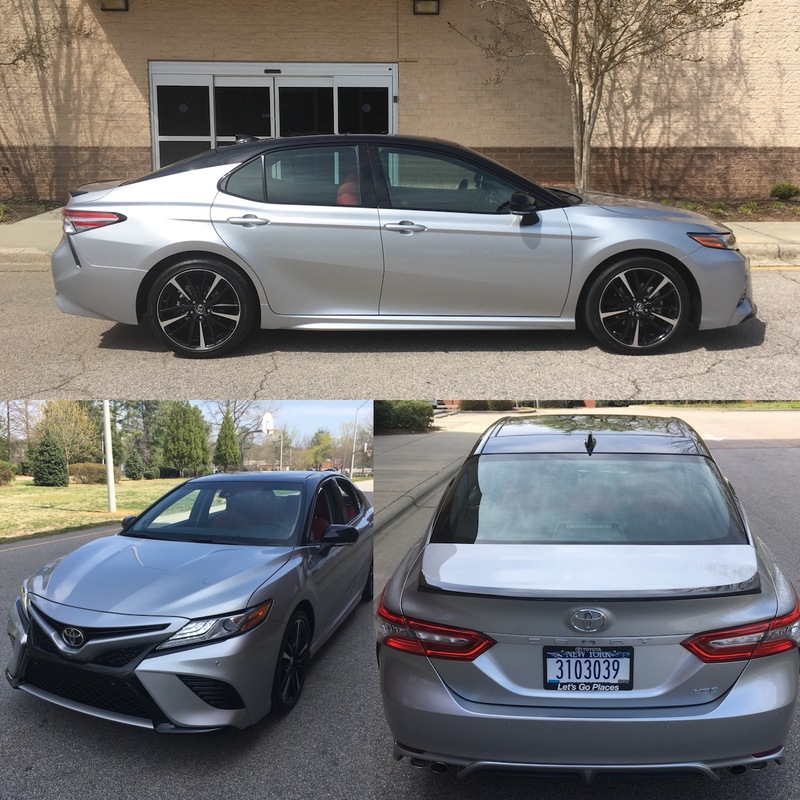 What was once bland is now grand — Toyota’s midsize Camry lost the last of its plainness when an all-new version of this midsize sedan rolled out for the 2018 model year. The latest Camry easily matches the segment’s pacesetters, delivering handsome sheet metal in its own right. I had the privilege of spending ample seat time with the XSE V6, the most powerful Camry ever built and a logical competitor to the V6-powered Nissan Maxima. The 2018 Toyota Camry comes in L ($23,495), LE ($24,000), SE ($25,200), XSE, ($28,450; $34,950 V6) and XLE ($29,000, $34,400 V6) trims. This front-wheel drive model seats five and has a hybrid variant, which Toyota markets separately. As before, the Camry offers a standard four-cylinder engine and an available V6. An eight-speed automatic transmission is now standard across the model line. Adorned with fresh sheet metal, the latest Camry is a clean sheet redesign. It sits lower to the ground, measures slightly wider and has about two additional inches between the wheels and overall. Front to back, the new Camry offers a sporty, if not stylish look. The upper grille offers a distinct smile, the lower grille a gaping maw. Sleek headlamps, fender cutouts and a creased hood enhance this sedan’s visual interest. Along the sides, you’ll find pronounced character lines, sculpting and a rising beltline. The long hood flows to the rear deck. On the XSE, the contrasting roof and body color meet to form a stylish wave. The trunk is topped with a contrasting spoiler. You’ll also find wraparound tail lamps with downforce indentations and a diffuser with quad exhaust tips. Toyota dresses the XSE with LED headlights and daytime running lights. A gloss black grille and smoked-out LED tail lamps are also present. Power heated side mirrors, a panoramic sunroof on V6 models and 19-inch black machine-finished wheels round out the standard features. The Camry’s longer wheelbase translates into improved cabin space, with excellent legroom front and back. This is a true five-passenger model, one that’s worth due consideration by families preferring a sedan and not a crossover or a minivan. For 2018, Toyota positions the driver’s seat lower and slightly inward, very much like some rear-wheel drive sport sedans. The sight lines are quite good and the overall feeling is relaxing as well as secure. The rear 60/40 split fold-down rear bench seat provides access to the trunk measuring 15.1 cubic feet, which is about average for the segment. What’s especially eye-popping about the interior is the design of the center console. It is set in place with a dividing bar, one that starts on the left at the instrument panel, then curves down and across the console to the right side. If you think it appears like one segment of a twisty road, then I’m in agreement with you there. The rest of the console pushes up and over to the right. Metal trim provides a separation between the panel and the bright red stitched material covering the lower dashboard. That look also graces the door inlays, the console cover and the seats. Stunning? Oh, yes! Especially since this is a “plain” Camry, not any Lexus model or even the natty Toyota Avalon. Overall, the cabin is comfortable and quiet — the XSE has an interior that’s a great match for the Nissan Maxima, itself based on the Altima’s platform. The design, choice materials and equipment support this model’s $35,000 asking price, with the test vehicle coming in just short of $40,000. Yes, for a Camry. A very elegant and sporty Camry at that. The Camry XSE brings in such features as leather-trimmed seats, heated and power-operated front seats with lumbar support, dual-zone climate control, rear seat adjustable headrests and an overhead console. This grade builds on all the other nice touches offered below it, including full power accessories, a tilt-and-telescopic steering column and embossed metal trim. Updated engines power the 2018 Camry. The base engine now makes 206 horsepower, while the V6 delivers 301 horsepower. Breaking the 300 horsepower threshold with the V6 is a significant accomplishment. What’s especially amazing is that you’ll enjoy stellar fuel economy. Indeed, some versions of the base engine deliver up to 29 mpg in the city and 41 mpg on the highway, while the V6 comes in at 22/33. What you have here are new engines that are more powerful and efficient than their predecessors. Our V6-equipped test model was surprisingly fun to drive. Even with power sent to the front wheels, the sedan stays planted. Not once did I find myself wrestling with the steering wheel because of torque steer — that sensation is simply not present. The 2018 Camry offers improved electric power steering, supplying generous input and responsive handling. Press down on the accelerator and the V6 surges. You have three drive modes to play with too — eco, normal and sport. Dial in sport and you’ll notice changes in engine responsiveness, transmission gearing, handling and the exhaust note. No, the Camry doesn’t match rear-wheel drive models in handling alacrity, but it most certainly holds its own. The rumbling engine and humming quad-pipe exhaust tips are a musical delight you’ll prize. Technology is a mixed bag with the 2018 Camry. On the one hand, it has the best standard suite of safety tech anywhere. On the other hand, its standard navigation app is a disappointment, while even its available navigation system is bettered by such competitors as the Chevrolet Malibu and Honda Accord. Most 2018 Camry models have Toyota’s Entune audio suite with an eight-inch screen and Scout GPS Link. Our family has a 2017 RAV4 with the app and I can tell you that it is often frustrating. The Scout can be difficult to connect and that’s a show-stopper for many. Quite frequently, my wife and I have had to turn to our Google travel app on our smartphones to get directions. Good thing we have unlimited data as the cost might be prohibitive. The Camry XSE and XLE models supply an integrated navigation system, that’s a much better deal than the app. That said, there were times when we were outside of a metropolitan area and the system could not give us our route. Again, the smartphone app saved us, but it’s unfortunate to rely on an outside source. The XSE does provide some nice touches, including an 8-inch color touchscreen, nine speakers, a CD player, USB ports and an auxiliary input jack, Bluetooth and multiple music apps. You also get Qi-compatible smart charging, a great feature we’re finding in more cars of late. The available connected WiFi may prove especially useful, particularly when you need to get directions. On the safety front, you’ll find such features as a rearview camera, automatic high beams, a pre-collision system with pedestrian detection, lane departure alert with steering assist and dynamic radar cruise control. The XSE model adds blind spot monitoring with rear cross-traffic alert. You’ll also find a sonar system with rear cross-traffic braking. The top-trim models also offer two important options: a head-up display and a bird’s eye camera. If you’ve stayed away from the Camry in the past for either its vanilla looks or sedate drive, the 2018 model turns things around. Sure, the base engine may not have the power some customers want, but it delivers stellar fuel economy. And you get that improved look. The V6 is better than ever, although to obtain same means paying well north of $30,000 to acquire one. In a market where six-cylinder engines are largely being replaced by turbo fours, Toyota’s lag-free power plant is certainly welcome. For some shoppers, the Camry also presents a bit of a quandary. Indeed, if you have a crossover on your list, such as the RAV4, the Camry is more luxurious and efficient. 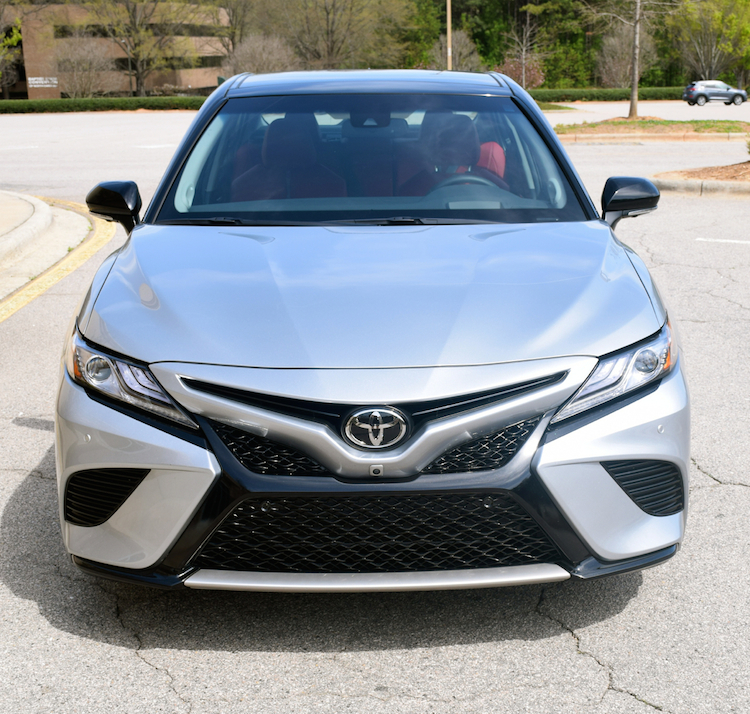 Further, if you’ve been considering an entry-level Lexus sedan, the Camry XSE may have you rethinking the IS, a sedan roughly the size and price of the Camry, although it has standard rear-wheel drive and available all-wheel drive. Lastly, if the Maxima is your top choice, the Camry XSE offers a more modern expression and matches Nissan’s “4-door sports car” on all things performance.